An interesting story -- "In the Garden: Heirloom Seeds or Flinty Hybrids?" -- ran in today's New York Times. The story, written by Times gardening columnist Michael Tortorello, compares heirloom seeds with hybrids. Johnny's Chairman and Founder, Rob Johnston Jr., is quoted in the article. The story helps explain why heirlooms have become increasingly popular among gardeners. But the heirloom boom has its detractors, Tortorello writes. The story details the strengths that many hybrids have over heirlooms, such as superior disease resistance and more consistent yields. At Johnny's, we trial dozens of heirlooms each growing season and select the best tasting varieties for our product line. We carry 55 varieties of vegetable heirlooms, including 20 different heirloom tomatoes. We also have 22 heirloom flowers available. I'll take heirlooms over hybrids any day of the year. There's more to growing food (and other plants) than one year's worth of disease resistance. Selecting the right seed for your area, planting at the right time, taking the proper pest/disease measures, and building a healthy growing environment are what we all need to do. 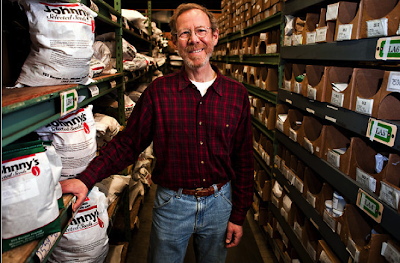 Thanks to Johnny's and all the seed savers of the world!